Our bicycle built for two. 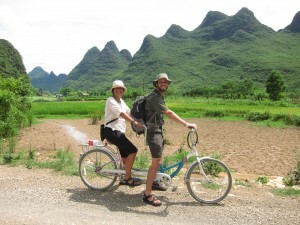 We were on the fourth hour of our five hour ride through the postcard-perfect karst-filled countryside of Yangshuo when we lost control of our bicycle built for two and skidded down a gravel road. We’d been wanting to visit a hospital in China and the skin hanging from Sasha’s knee gave us just the excuse we needed. My mother and father had visited hospitals in China almost 25 years ago on some kind of medical exchange. Their stories didn’t inspire confidence, but 25 years had transpired and Sasha didn’t need major surgery so we crossed our fingers. It’s worth noting that, before arriving at the hospital, with a deep gash the size of a passport photo on her knee and a trickle of blood running down her leg, Sasha got back on the bike and peddled for the hour it took us to get back to town. She didn’t really have a choice since walking would have taken a lot longer, but she didn’t complain once. She even stopped to take a picture of a sign offering cat for dinner. The picture at the bottom is of a cat. Who's hungry? 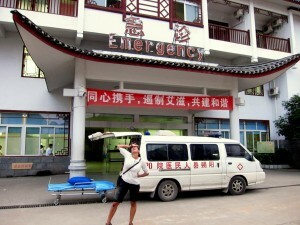 The Yangshuo People’s hospital is the fancy hospital or so we were told. 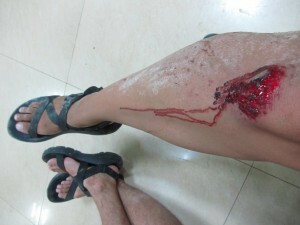 Sasha’s wound spoke pitch-perfect Cantonese and we were ushered into “First Aid Station 1” right away. We were grateful not to be going into the “Facial features first aid station”. As they cleaned and disinfected her wound I took a picture of her in agony. Again, she really was a trooper. Sasha arrives at the hospital. With a bandage on her knee, the doctor gave us three slips of paper and told us to go to the cashier. Having no idea what the slips said, we enlisted the help of a new friend who explained the papers would get Sasha two injections. Eventually, we figured out that one was for tetanus and had it removed from the list since Sasha was up to date. But we couldn’t quite get the other translated. They led us into the “injection room” which, it turns out, was where people received their IV drips. The doctor had ordered IV antibiotics, at least that was the plan. Between unnecessary antibiotics and an ever-present concern about sterile needles, I was not comfortable with this treatment plan and insisted we make an exit. So as not to offend, Sasha cleverly explained to the doctor that she was terrified of needles and we had our own antibiotics. He informed us we would not be getting a refund. We gladly let them keep the $12. Is that white van a Chinese ambulance? Did they find that at Woodstock in 1969? I have always wanted to try curry cyat. Yum. After reading about this and the motorcycle accident, think you need to a section to your quickstats that says… “minor injuries” or “blood spilled”. I can’t tell you how much I am enjoying this trip, thanks for sharing! You may not be surprised that Josh thought ahead and has been tracking “blood spilled” from the start. Great minds…! My goodness! Glad you are both “okay” – that sure has to hurt! 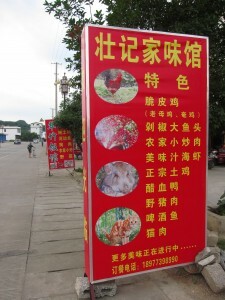 As for the cat meal… Wow… I won’t even make a “must taste like chicken” joke since they show a photo of a fluffy sweet cat to top it off. glad to see that you both are ok. well you had to see the hospital the hard way I guess! I hope this doesn’t hinder any of your adventures. Take care & keep that wound clean. Wow, so glad you are okay. Even an accident turns into an adventure for you two. I agree about the needles–wise not to trust that they are sterile. 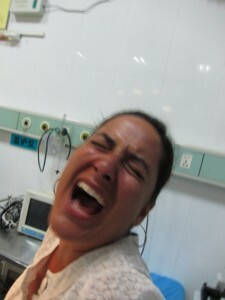 In Peru it is BYO—even in the hospital. Are you back on the bicycle?? Such a cute “before” picture.